Los Angeles Class Attack Submarine: Laid down, 12 August 1972, at the Electric Boat Division of General Dynamics Corp., Groton, CT.; Launched, 19 October 1974; Commissioned, USS Philadelphia (SSN-690), 25 June 1977. Philadelphia was decommissioned on 25 June 2010. Specifications: Displacement, Surfaced: 6,000 t., Submerged: 6.927 t.; Length 360'; Beam 33'; Draft 29'; Speed, Surfaced 25 kts, Submerged 30+ kts; Depth limit 950'; Complement 129; Armament, four 21" torpedo tubes aft of bow can also launch Harpoon and Tomahawk ASM/LAM missiles & MK-48 torpedoes; Combat Systems, AN/BPS-5 surface search radar, AN/BPS-15 A/16 navigation and fire control radar, TB-16D passive towed sonar arrays, TB-23 passive "thin line" towed array, AN/BQG-5D wide aperture flank array, AN/BQQ-5D/E low frequency spherical sonar array, AN/BQS-15 close range active sonar (for ice detection); MIDAS Mine and Ice Detection Avoidance System, SADS-TG active detection sonar, Type 2 attack periscope (port), Type 18 search periscope (starboard), AN/BSY-1 (primary computer); UYK-7; UYK-43; UYK-44, WLR-9 Acoustic Intercept Receiver, ESM; Propulsion System, S6G nuclear reactor one propeller at 35,000 shp. 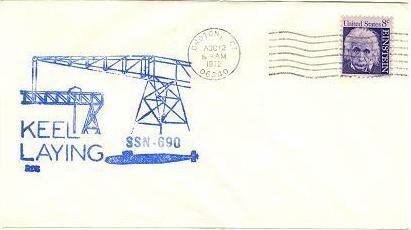 14k Commemorative post mark on the occasion of the keel laying of Philadelphia (SSN-690), 12 August 1972, at the Electric Boat Division of General Dynamics Corp., Groton, CT. Courtesy of Jack Treutle (of blessed memory). 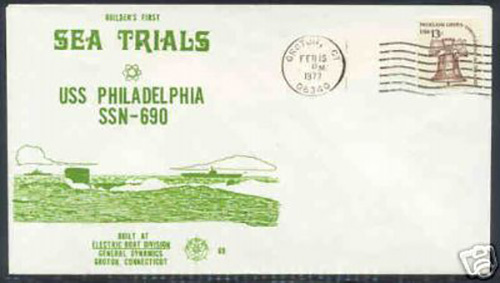 257k Cover of Philadelphia's (SSN-690) Keel Laying Booklet, 12 August 1972. Courtesy of Robert M. Cieri. 1.41k Twenty one page Joint Keel Laying of the Indianapolis (SSN-697) and Launching PDF of the Philadelphia (SSN-690), 19 October 1974. PDF courtesy of Scott Koen & ussnewyork.com. 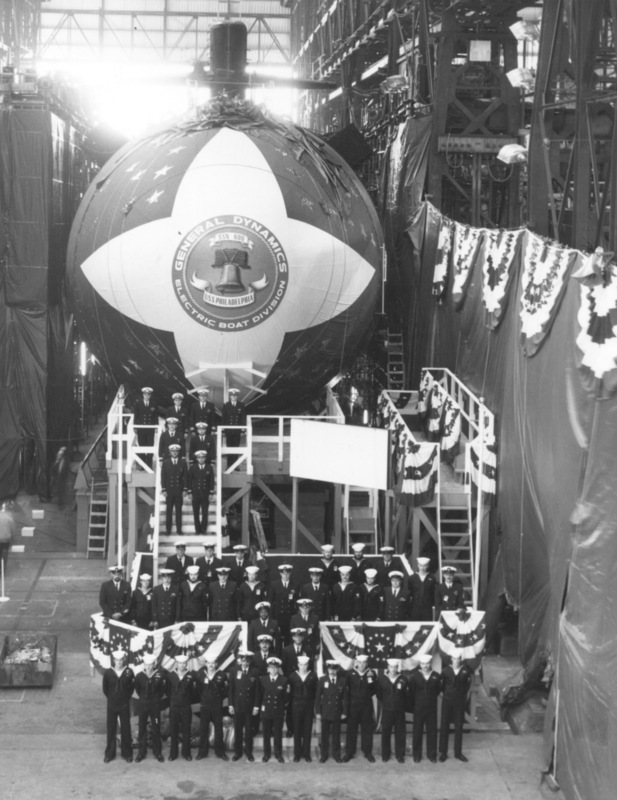 604k The crew of the Philadelphia (SSN-690) stand alongside before her launching on 19 October 1974. Photo courtesy of Scott Koen & ussnewyork.com. 591k Philadelphia (SSN-690), sliding down the launching ways at the Electric Boat Division of General Dynamics Corp., Groton, CT., 19 October 1974. Photo courtesy of Scott Koen & ussnewyork.com. 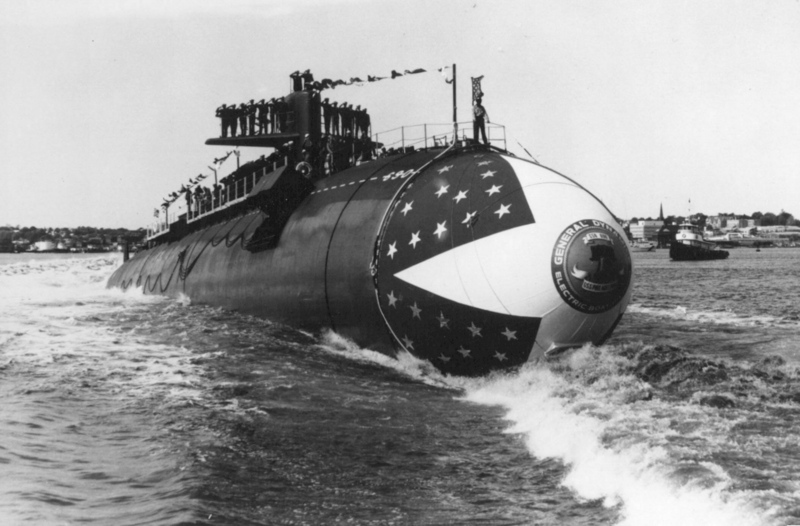 683k Philadelphia (SSN-690) is waterbourne after her launching. Photo courtesy of Scott Koen & ussnewyork.com. 214k Commemorative post mark on the occasion of Philadelphia's (SSN-690) launching, 19 October 1974, at the Electric Boat Division of General Dynamics Corp., Groton, CT. Photo courtesy of Scott Koen & ussnewyork.com. 40k Philadelphia (SSN-690), at sea, probably during her alpha sea trials off the coast of New England, 1975-77. Courtesy of Electric Boat. 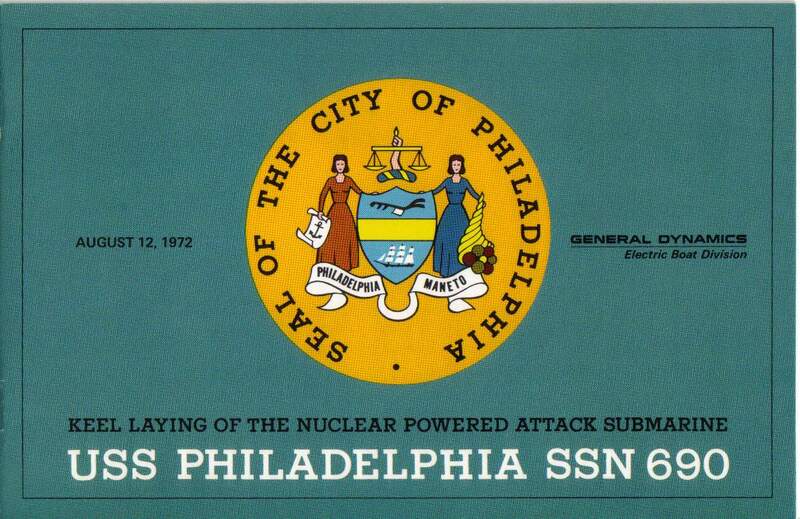 895k Twelve page Welcome Aboard the Philadelphia (SSN-690) PDF. PDF courtesy of Scott Koen & ussnewyork.com. 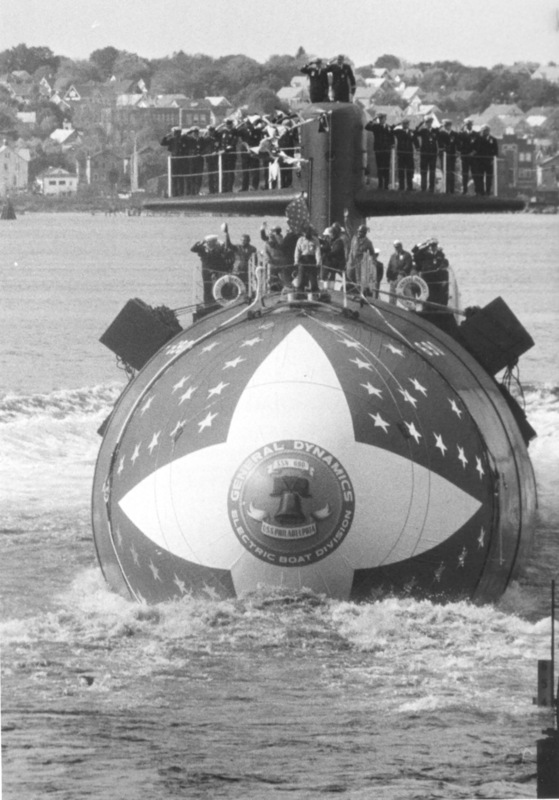 54k Commemorative post mark on the occasion of Philadelphia's (SSN-690) sea trials, 15 February 1975. Courtesy of Jack Treutle (of blessed memory). 82k Starboard side view of the Philadelphia (SSN-690). This photo was taken in late June 1984 when the ship was en route from New London, CT to Portsmouth, NH for its first overhaul. If you look closely, you can see it does not have the deployable towed array housing down the starboard side topside, which was added during the overhaul. I was not on board for this transit. 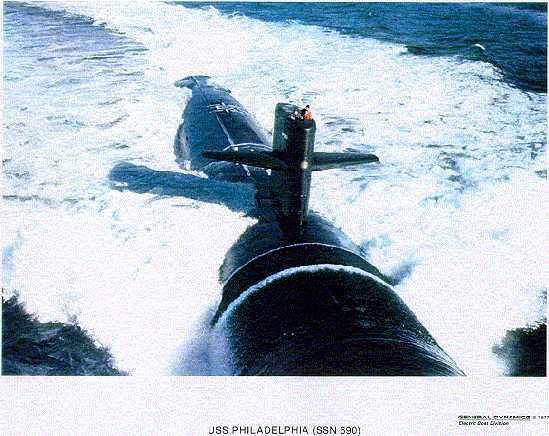 Ironically, I was aboard the Groton (SSN-694) at the time being observed for my dolphins by the Commodore somewhere beneath these very waves because Groton was doing it�s POM Cert using Philadelphia as a target! Text & photo i.d. courtesy of Kevin Torcolini. 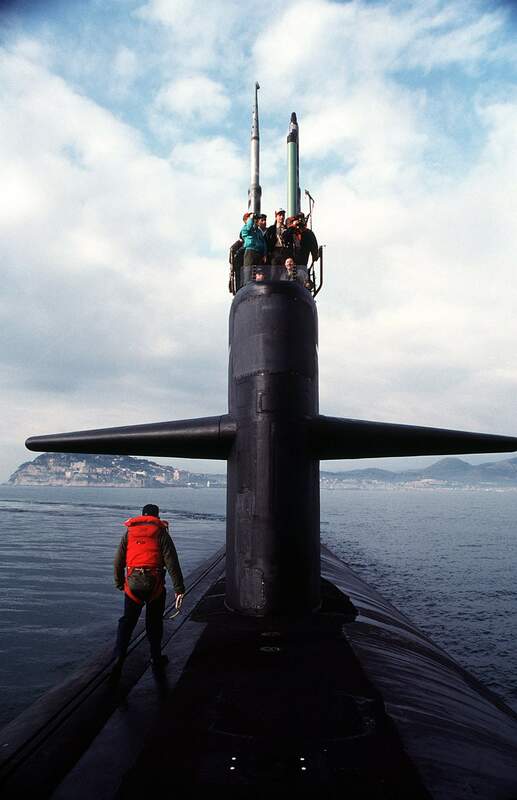 279k Members of Boy Scout Troop 85 join CMDR Ryan, the ship's commanding officer, in standing atop the sail of the nuclear-powered attack submarine Philadelphia (SSN-690) as the vessel returns to Gaeta's harbor. The troop has been aboard the vessel for a 36-hour stay arranged by Commander, Sixth Fleet, on 5 January 1991. Official USN photo # DN-ST-92-02766, by JOC Kip Burke, from the Department of Defense Still Media Collection, courtesy of dodmedia.osd.mil.& submitted by Bill Gonyo. 77k Rear Admiral Douglas J. McAneny early sea tours included assignments as Division Officer, Trepang (SSN-674); Engineer, Tunny (SSN-682); Executive Officer, Drum (SSN-677); and Officer-in-Charge of Moored Training Ship Sam Rayburn (MTS-635). 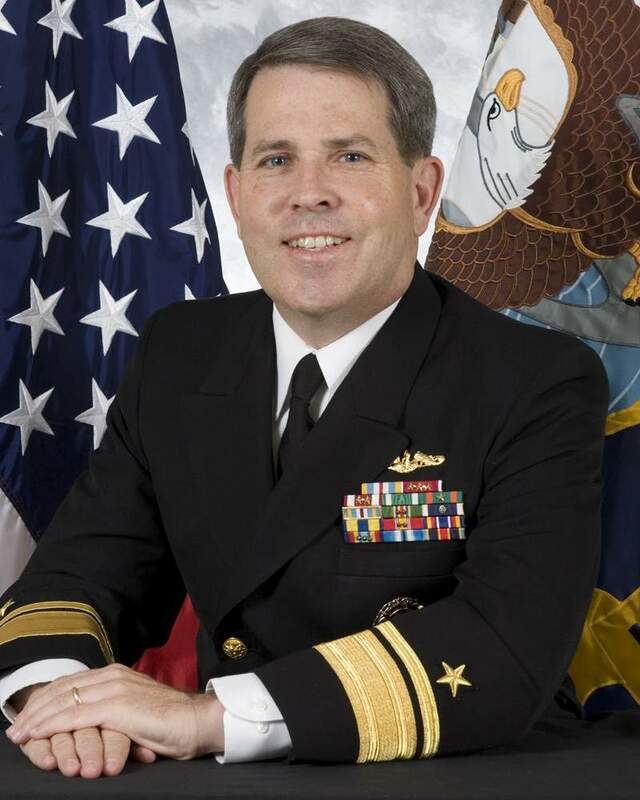 McAneny�s first command assignment was as commanding officer of Philadelphia (SSN-690) from 9 June 1995 to 5 March 1998. During his command, the ship was awarded three consecutive Battle "E" Awards. USN photo courtesy of cpf.navy.mil/bios/deputy. Photo courtesy of Bill Gonyo. 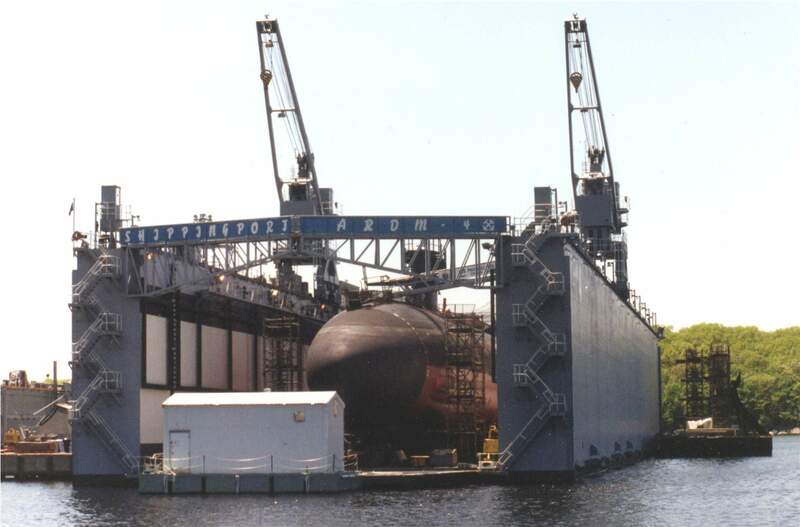 192k Philadelphia (SSN-690), in floating drydock Shippingport (ARDM-4) (background) at Groton, 28 July 1996. Photo by Ken Hart. 470k Members of SEAL Delivery Vehicle Team Two (SDVT-2) huddle together inside a flooded Dry Deck Shelter mounted on the back of the attack submarine Philadelphia (SSN-690), 5 May 2005. 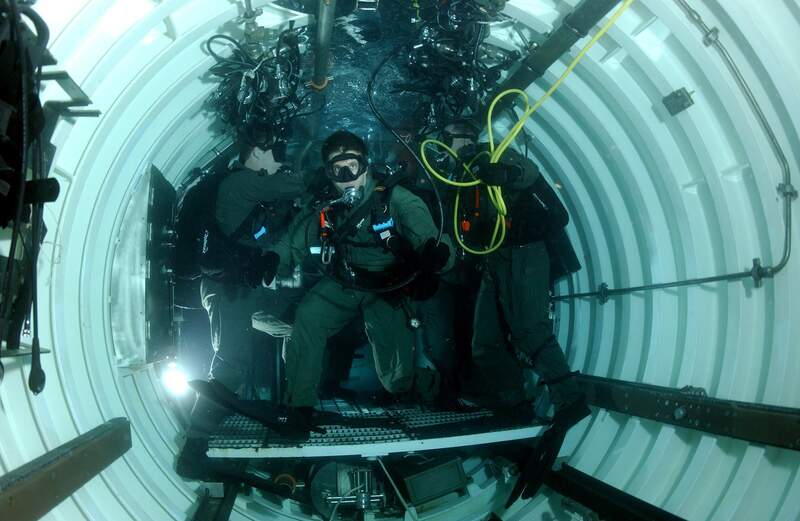 Dry Deck Shelters (DDS) provide specially configured nuclear powered submarines with a greater capability of deploying Special Operations Forces (SOF). 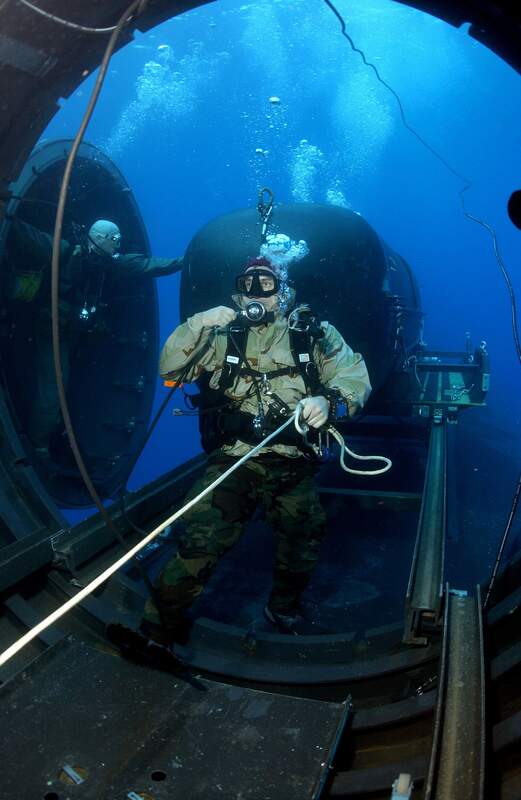 DDSs can transport, deploy, and recover SOF teams from Combat Rubber Raiding Crafts (CRRCs) or SEAL Delivery Vehicles (SDVs), all while remaining submerged. SDVT-2 is stationed at Naval Amphibious Base Little Creek, Va., and conducts operations throughout the Atlantic and Southern, and European command geographic areas of responsibility. USN photo # N-3093M-009 by Chief Photographer's Mate Andrew McKaskle, courtesy of navy.news.mil. 511k A member of SEAL Delivery Vehicle Team Two (SDVT-2) prepares to launch one of the team's SEAL Delivery Vehicles (SDV) from a Dry Deck Shelter on the back of Philadelphia (SSN-690), 5 May 2005. USN photo # N-3093M-006 by Chief Photographer's Mate Andrew McKaskle, courtesy of navy.news.mil. 555k Members of SEAL Delivery Vehicle Team Two (SDVT-2) launch one of the team's SEAL Delivery Vehicles (SDV) from a Dry Deck Shelter on the back of Philadelphia (SSN-690), 5 May 2005. USN photo # N-3093M-004 by Chief Photographer's Mate Andrew McKaskle, courtesy of navy.news.mil. 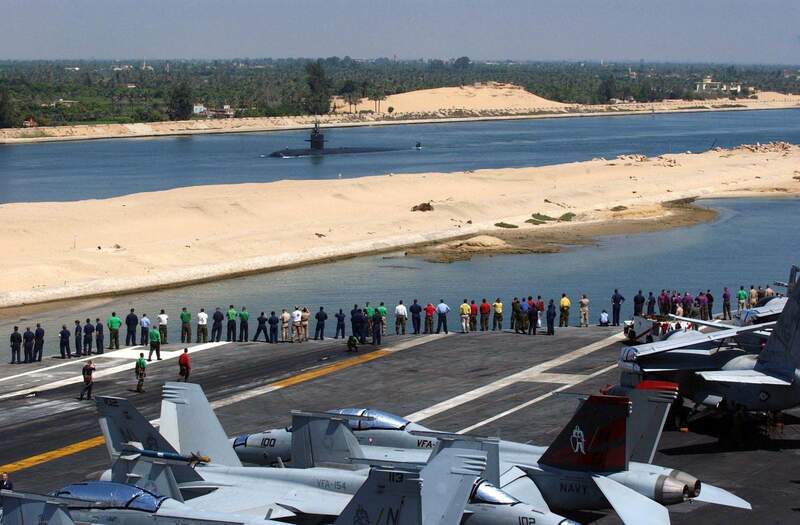 297k Sailors stationed aboard the Nimitz class aircraft carrier Carl Vinson (CVN-74) observe the Los Angeles class submarine Philadelphia (SSN-690) as they pass one another while transiting the Suez Canal, 8 July 2005. The Carl Vinson Carrier Strike Group is currently deployed to the 6th Fleet area of operations and will end its deployment with a homeport shift to Norfolk, Va., to complete a three-year refuel and complex overhaul. USN photo # N-2198V-001 by Photographer's Mate Airman Crystal Vigil, courtesy of navy.news.mil. 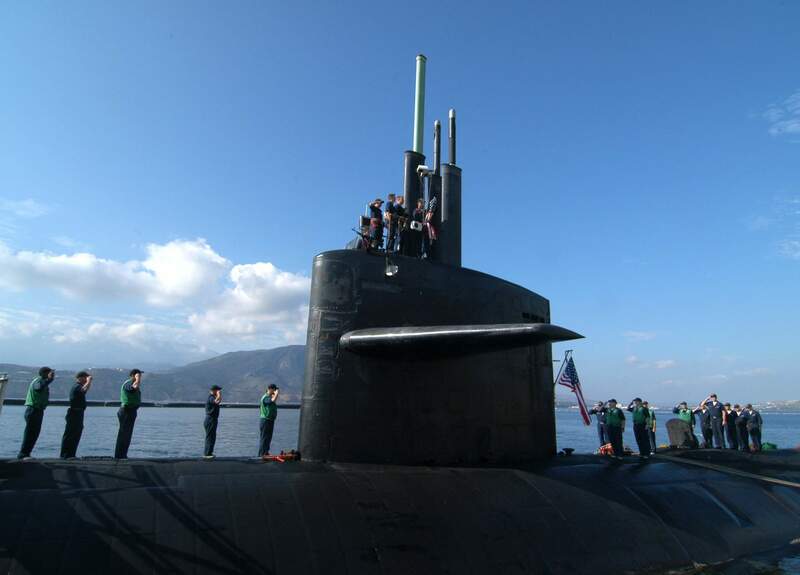 145k Crew members aboard the Philadelphia (SSN-690) salute the national ensign as the "shift colors" order is carried out upon their arrival at the Marathi NATO Pier Facility in Souda Bay, Greece, for a routine port visit. USN photo # N-0780F-004 by Mr. Paul Farle, courtesy of navy.news.mil. 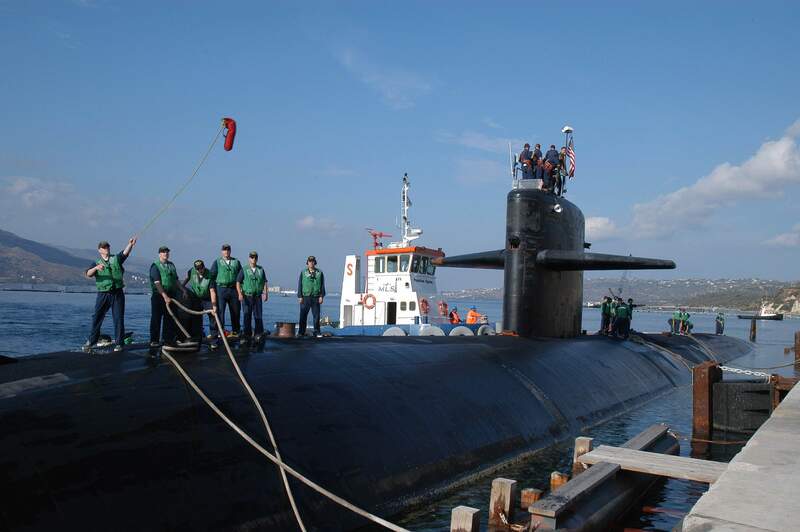 416k The Los Angeles class fast attack submarine Philadelphia (SSN-690) ties up to the dock with some help from a tugboat as she arrives in Souda Harbor 14 October 2005 for a routine port visit to Greece's largest island. 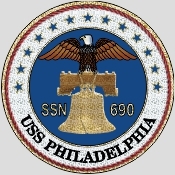 Philadelphia is homeported in Groton, Conn., and began a scheduled deployment in June 2005. USN photo # N-0780F-006 by Mr. Paul Farle, courtesy of navy.news.mil. 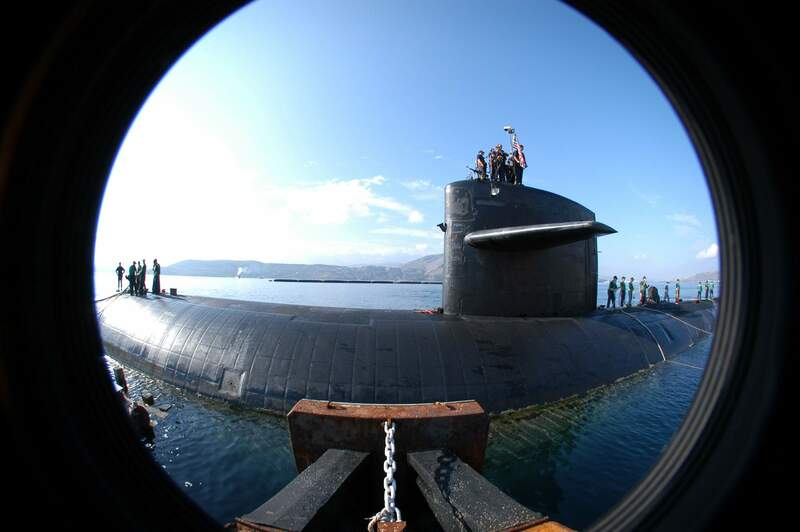 185k Crete lies in the background and the Philadelphia (SSN-690) takes on a boomerang shape of the zoom lens of the camera as she lies to port in Souda Harbor. USN photo # N-0780F-005 by Mr. Paul Farle, courtesy of navy.news.mil. 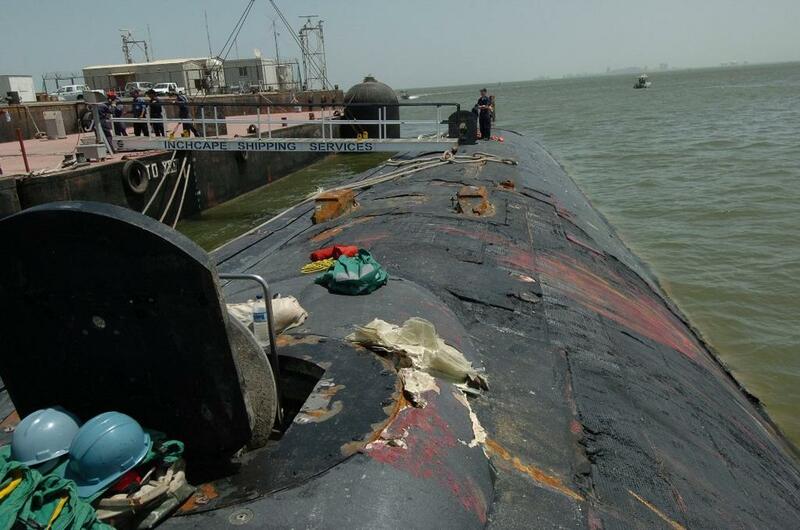 105k "Crunch Time" for the Philadelphia (SSN-690) arrived after being run down by the 53,000 ton bulk carrier Turkish cargo ship Yaso Aysen's bow in the Persian Gulf, 5 September 2006. USN photo courtesy of Bill Gonyo. 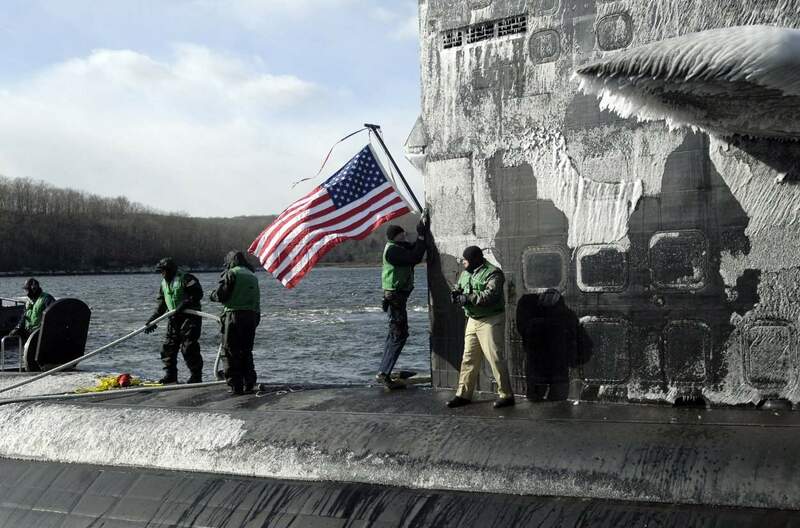 157k Sailors aboard the fast attack submarine Philadelphia (SSN-690) moor the boat to the pier and hoist the American flag upon return to Naval Submarine Base New London on 26 January 2007. Strong winds and low temperature in the teens caused ice to engulf the sail of the ship. USN photo # N-8467N-001 by John Narewski courtesy of navy.news.mil. via Bill Gonyo. 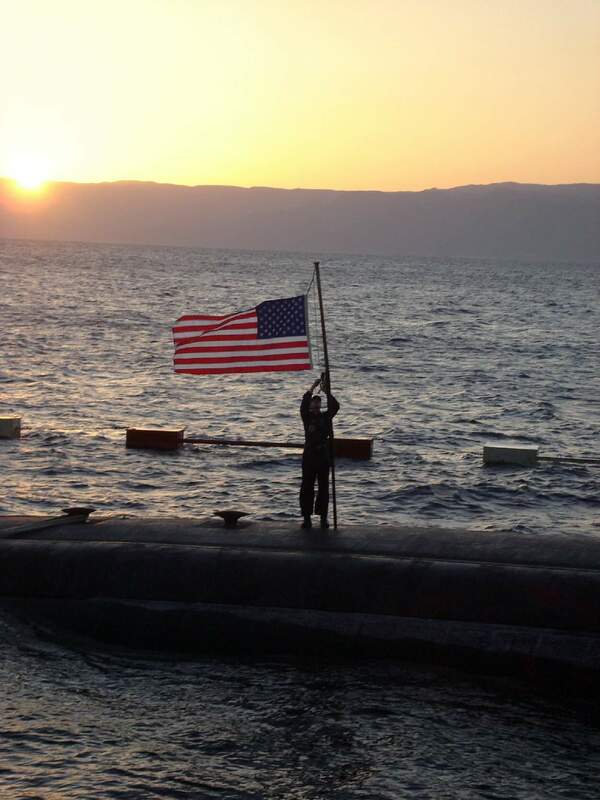 187k Sonar Technician Submarines 3rd Class Anthony Morandi observes evening colors on Christmas aboard the attack submarine Philadelphia (SSN-690) during a port visit in the Middle East. USN photo # N-4571H-001 by Ensign James Heckman, courtesy of navy.news.mil. 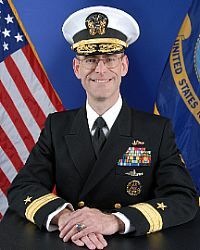 16k Following nuclear power training, Rear Admiral Douglass T. Biesel completed sea assignments aboard Lapon (SSN-661), Michigan (SSBN 727 � Blue), Annapolis (SSN-760) and a command tour aboard Philadelphia (SSN-690) during which time the ship was awarded the Commander, Submarine Squadron 12 Battle Efficiency �E� Ribbon and Meritorious Unit Commendation. USN photo courtesy of cpf.navy.mil/bios/deputy. Photo courtesy of Bill Gonyo. 205k Storekeeper 2nd Class Mike Hyatt shovels off the pier next to the fast-attack submarine Philadelphia (SSN-690) on a blustery, snowy morning 22 February 2008. 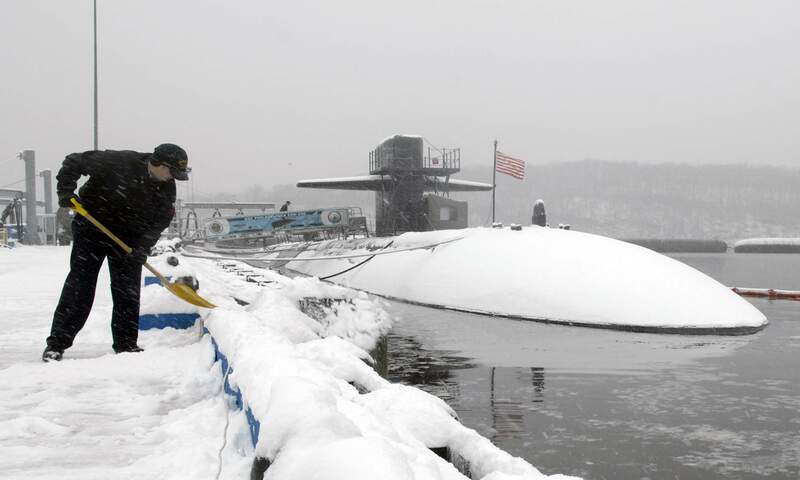 A snowstorm arriving earlier than predicated caused problems across the region and Sailors on Naval Submarine Base New London had to work hard to keep up with it. USN photo # N-8467N-004 by John Narewski, courtesy of navy.news.mil. via Bill Gonyo. 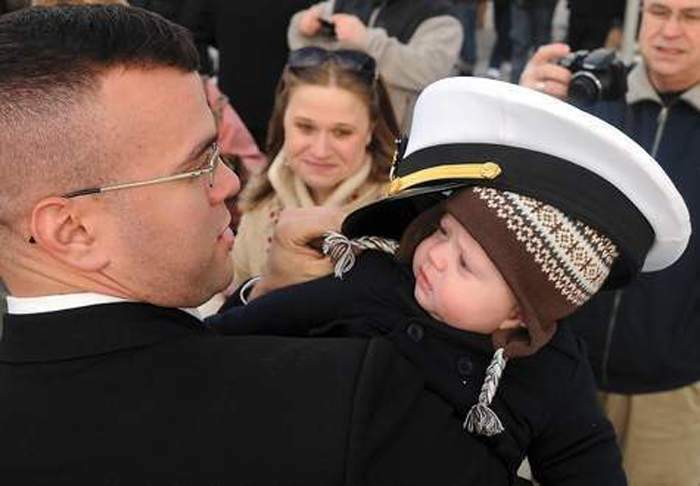 680k Lt. Joseph DeCicco places his cap on the head of his son, Noah, 4 months old, during their first meeting at the homecoming for the Philadelphia (SSN-690) 7 February 2010 at the Naval Submarine Base in Groton. In the background is Lt. DeCicco's wife, Kristen DeCicco of Groton, and his father-in-law, Rick Holloway of Waterford. The Philadelphia returned from its final deployment and is expected to be decommissioned later this year. Nicholas Harr said hello to his son for the first time on Wednesday, and goodbye to his ship. Harr, an electronics technician first class, said it was an honor to serve on the Philadelphia for almost six years. "Bittersweet is definitely the best word to describe it," he said. Harr was on the deployment in November when his first child, Alexander, was born. His wife, Ashley, and another new mother, Kristen DeCicco, strung a sign between their children's strollers that said, "Move out of my way, I'm here to meet my daddy!" "We figured if someone didn't move over, we were running them over," Ashley Harr said, shortly before she and DeCicco charged down the pier, babies in tow. "This is amazing," Lt. Joseph DeCicco said, holding his son, Noah, for the first time. "I'm glad I get to see him, finally." 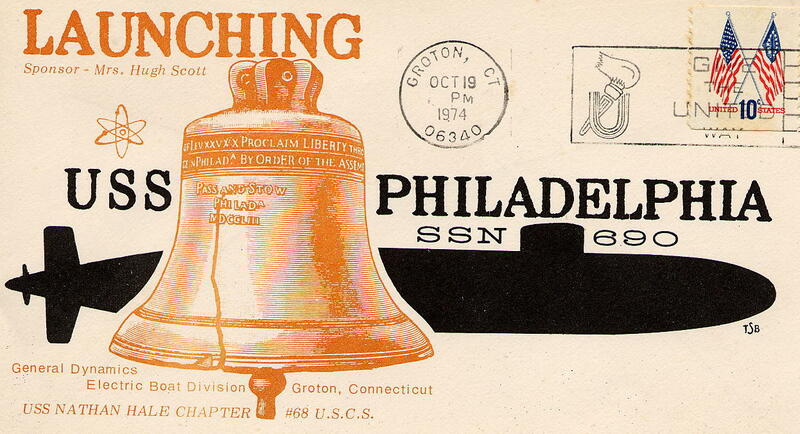 DeCicco said serving on the Philadelphia for three years was "definitely memorable." "I hope we made all of the former Philadelphia sailors proud," he said. Cmdr. John Spencer said it was an honor to command the submarine on the final deployment because "you start realizing the history involved." "It starts with the Cold War, goes through the war on terrorism and all of the major events that have been a part of our national security in those 30 years," Spencer said, adding that the crew "really feels part of something special." The submarine made port calls in Scotland, Bahrain and Gibraltar. The Philadelphia has traveled around the world for three decades to support various operations, including Desert Storm in 1991. 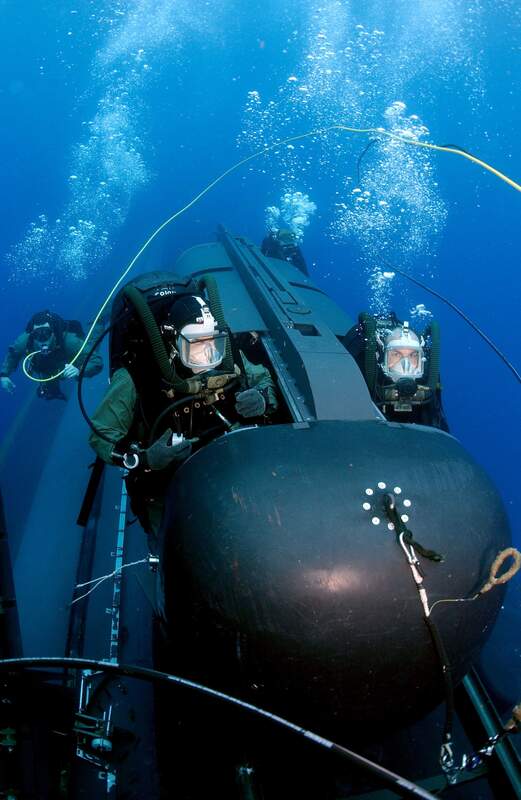 In 2004, the Philadelphia became the first submarine and only the fourth nuclear submarine ever to make 1,000 dives. 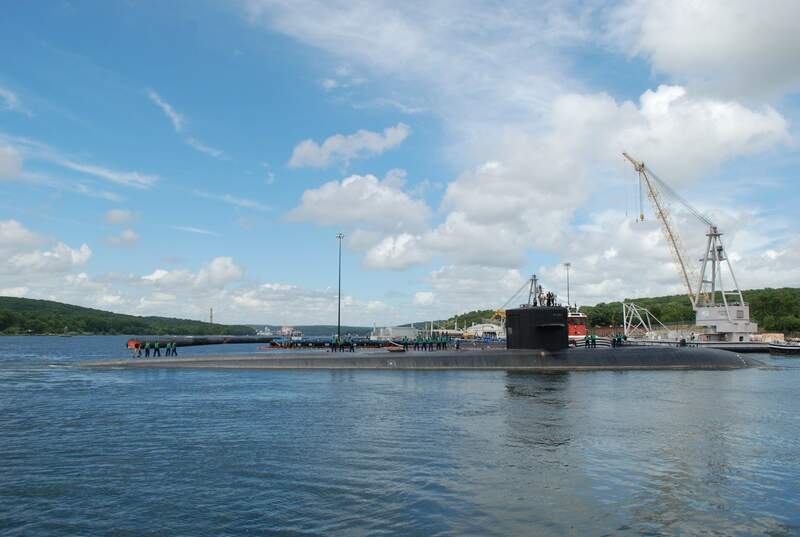 Spencer said the submarine's success over the years is a testament to how well Electric Boat built it, and to the 33 years of crews that served on it. Moneeka Mann was the first to greet the submarine, since she was chosen for the ceremonial first kiss - the last first kiss, in this case. Her husband, Deronte Mann, is a sonar technician second class. "We've been through three deployments with the Philadelphia," she said. "So this is a good way to end it." Photo & text courtesy of Dana Jensen/The Day courtesy of thesubreport.com. 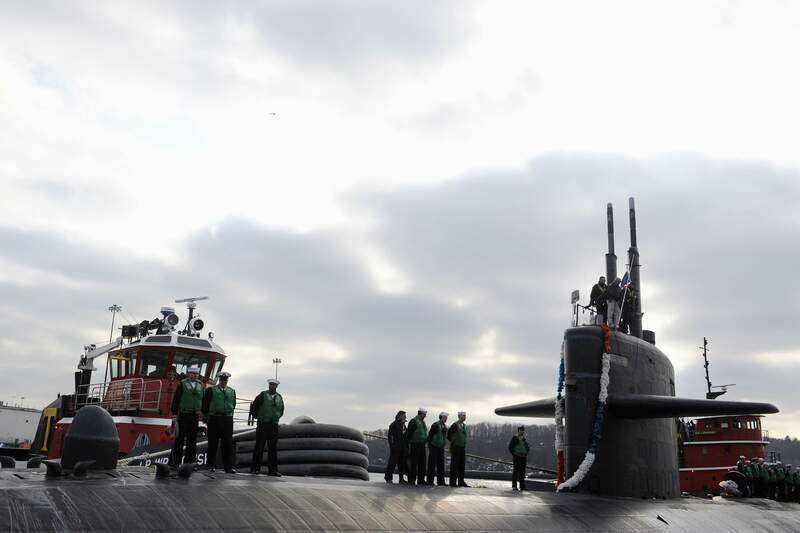 295k The attack submarine Philadelphia (SSN-690) pulls into Submarine Base New London after returning from her final deployment on 3 February 2010. USN photo # N-8467N-007 by John Narewsk, courtesy of navy.news.mil. 313k Cmdr. 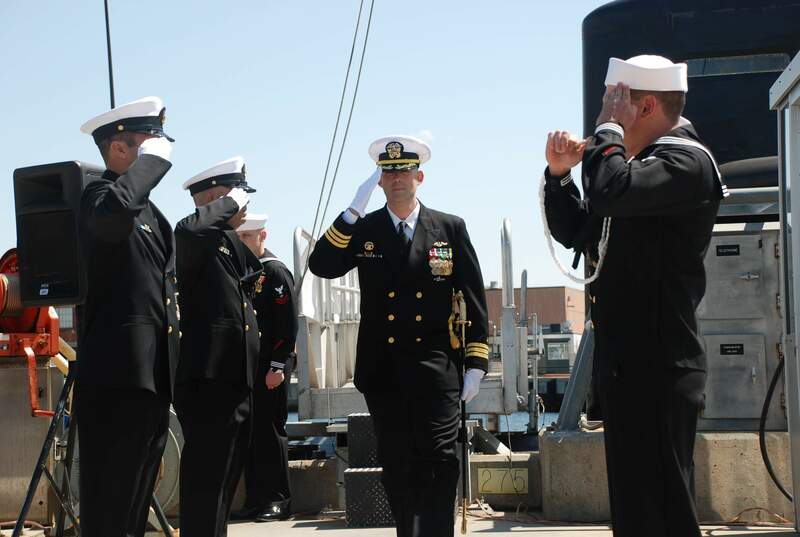 Dave Soldow, Commanding Officer, Philadelphia (SSN-690), departs through the sideboys following a change of command ceremony at Naval Submarine Base New London. Soldow assumed command of the submarine from Cmdr. John Spencer on Friday, 23 Apr, 2010. He will serve as her last Commanding Officer. USN photo # N-6665M-142 by Electronics Technician Second Class Mark Moore via Bill Gonyo, courtesy of navy.news.mil. 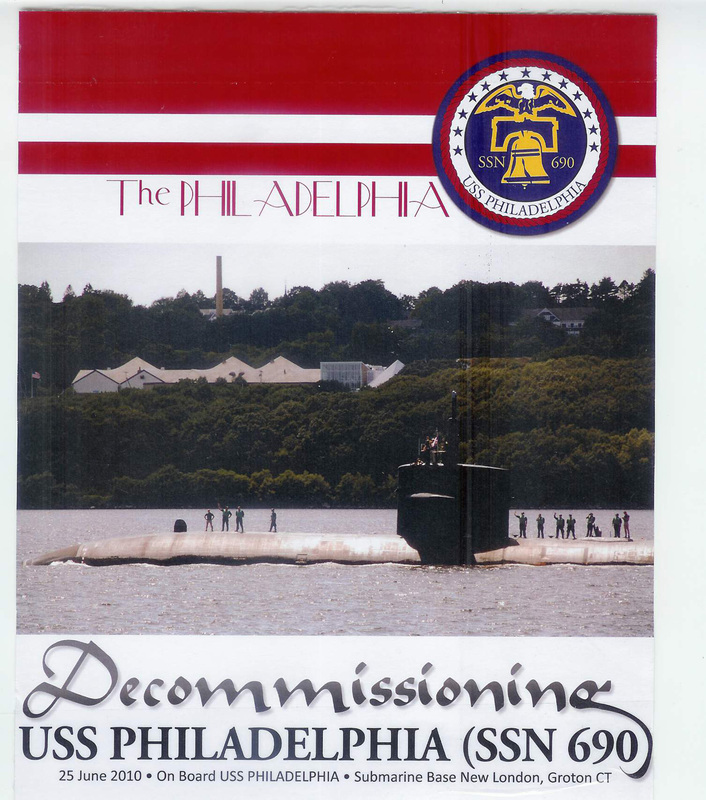 698k Philadelphia (SSN-690) decommissioning program on 25 June 2010. Photo courtesy of Ron Reeves (of blessed memory). 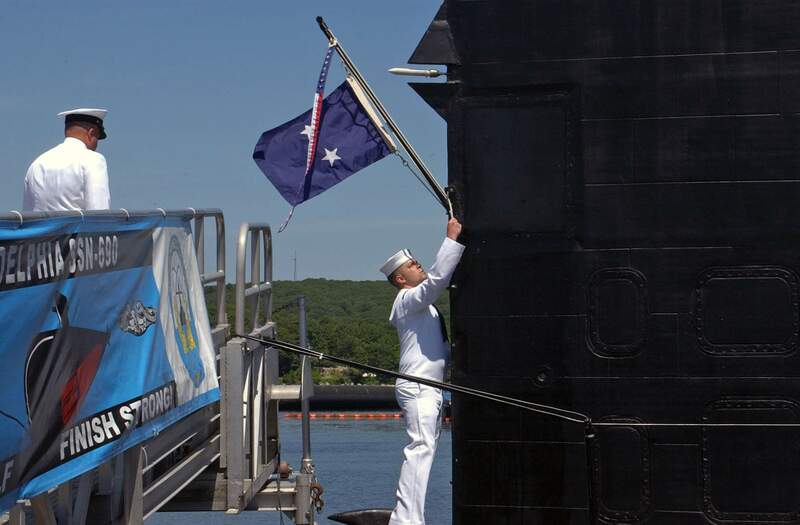 200k Electronics Technician 1st Class Nicholas Harr lowers the commissioning pennant aboard the attack submarine Philadelphia (SSN-690) during the submarine's decommissioning ceremony on 25 June 2010 at Naval Submarine Base New London. 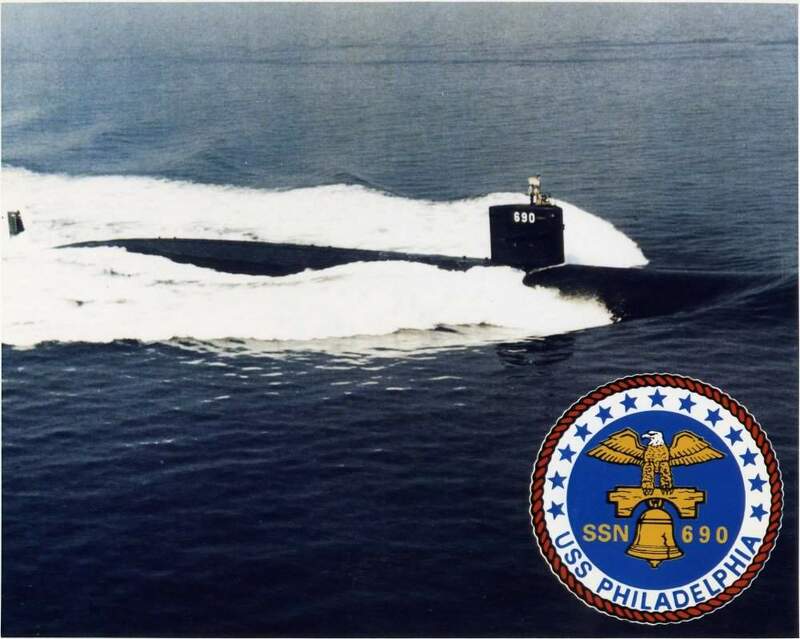 Philadelphia served the submarine force for 33 years. USN photo # N-5188B-079 by Mass Communication Specialist 1st Class Peter D. Blair, courtesy of navy.news.mil. 356k The attack submarine Philadelphia (SSN-690) transits the Thames River after departing Naval Submarine Base New London 9 July 2010 for the final time to complete the process of being retired from the U.S. Navy fleet. Philadelphia heads to Norfolk Naval Shipyard in Portsmouth, Va, where she will be dismantled, defueled and officially decommissioned. USN photo # N-8750E-149 by Lt. Patrick Evans, courtesy of navy.news.mil. 3.78k One Philadelphia (SSN-690) sub to go. PDF courtesy of Ron Reeves (of blessed memory).